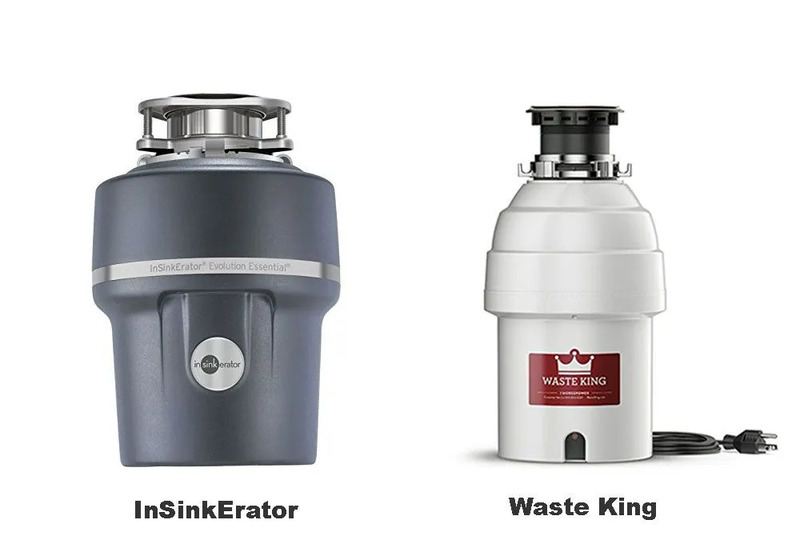 If someone is buying a new garbage disposal and they ask me – or even you – what brand would be a good recommendation, I know for sure that most of our answers will be the same: it’s either Insinkerator or Waste King. How do I know that? Because I’m magical, baby! That wasn’t such a good joke, was it? But you know I’m right. Insinkerator and Waste King are without a doubt the best at the moment. Both are two of the most versed companies in the game: Founder of Insinkerator, John W. Hammes invented the garbage disposal in 1927, and Waste King has been in the business for more than 50 years. Don’t get me wrong here. I’m not saying just because they have more years in their pockets, they’re automatically better. That depends on other factors. I’m just saying that they are more likely to have good experience in making food disposers of high efficiency. And judging by how well their products are still selling and how trusted they are, they indeed do so. Therefore, as far as a good investment goes, food waste disposal units from the two brands are safer bets. Still, how about we take it another step further? Let’s see who’s got the upper hand between the two. An “Insinkerator vs. Waste King showdown” kind of thing. I personally think it’ll be fun AND beneficial. Surely it can’t hurt to know more and we’ll even have extra information to refer to for future purchases. All in all, it’s just a good deal. If you find this article useful even in the slightest, consider leaving a comment or sharing with your friends. That’d mean the world to me. Thanks in advance! To see if either one of the two companies is the better, one must be thorough. There are quite a few elements that we need to go through. Let’s just get started without further ado. I think it’d be much more convenient to have this little segment right here in case you just need a quick glance at the main points. Below is the summary chart of the whole comparison. So, have a look! The price is always one of the top concerns when kitchen appliances is the topic of discussion. Most of the time, each home, each family have their own budget for specific investments. We all know it. So does Insinkerator. Their collection of residential food disposer targets very specific family contexts. The Badger series, the low priced line ($90-150) with a compact design, consisting entirely of ⅓, ½ and the new ¾ horse power (HP) models. The series aim at small residents with small cabinet space. For instance, if you’re now living in an average flat or apartment with another roommate or a partner, the standard Badger 5 would be perfect. It doesn’t cost much and is very compact. Meanwhile, the Evolution series is a top-tier line with higher price (>250$) and higher quality, possessing a strong motor, noise insulation technology and Multi-grind mechanism. The series is built for those who don’t mind paying a bit for excellence. Even a home of 8 or 9 members won’t be a problem, especially not to the Evolution Excel. The machine, featuring sound deadening pads and the exclusive Multi-grind, is certainly capable of reducing all kinds of food waste to mulch without interfering with your conversation. All garbage disposers from Insinkerator are equipped with a Dura-Drive ® induction motor, designed and built exclusively for the task of food disposal. Although PMM (permanent magnet motors) have been the top choice in recent years, the company persists in sticking with the induction motor. And it’s not without a good reason. Over the years, the company has made efforts in adjusting their motor so that it can offer the most while taking only a small portion of the manufacturing costs. Additionally, the Dura-Drive mechanism provides significant improvements to accuracy and durability, turning the motor into a valuable component. There is no noticeable difference in the grind chamber between Insinkerator and Waste King products – at least that is the case of the Badgers. The Evolutions, however, is on another level. The Multi Grind ®, the unique mechanics of the Insinkerator Evolutions are what places the series above the others. A specialized grind ring, extra supporting impellers and a post-process cutting disc help the Evolutions produce the finest ground results that have never been seen before. As for the components, the Badger series are geared with galvanized steel as they don’t use much force and galvanized steel is the most cost-efficient material for such power. Evolutions, of course, are with stainless steel grind parts so as to enhance the grind capability. This is one of the biggest issue of food waste disposers, and of the Badger series. They are loud – there is no need for sugar-coating. The reasons why the series stay loud for such a long time without any changes is that sound-proofing costs money. Simply nothing can be done without expanding the price tag of the series. The Evolution series reflect that. With top-notch noise insulation additions, those models are among both the quietest and most expensive ones in the market. Insinkerator has only two lines of garbage disposals, as I’ve mentioned earlier, and each line has their own look, which basically means that there are only two shapes to the Insinkerator residential collection. The Badgers have a long cylindrical-shaped case, with a limited diameter. Their vertical length varies between 11.5” and 12.6”. Their diameters, on the other hand, are the same at 6.3”, despite the difference in HP. It’s clear that the Badger models can fit well in even the smallest kitchen. The Evolution series are about the same length. The models max out at 13”. Their “waist” is the main problem. It can be seen that they are quite bulky due to the noise isolation pads. The biggest of them reaches 13” in diameter (Evolution Septic Assist). The smallest is still quite big, with 8.8” across. Insinkerator warranty is such a treat to consumers. Depending on the model, the period of valid warranty varies, the longest being 7 years. Duration wise, it’s not that great; I get it, but what you get during the period is the true value. As long as their We come to you ™ In Home warranty is in effect, the company will send people whenever their services are needed. Even better, all the expenses will be covered, from labor to replacement costs. Basically, you won’t need to worry about a thing. It’s quite simple really. Besides the permanent magnet motor, Waste King offer no remarkable features whatsoever, but THAT is their approach. And apparently, it worked. Their sales just look astonishing. On another note, there are two versions to most of the models: the EZ mount and the 3-bolt mount. For example, they have the Waste King L-8000, which is an 1 HP EZ mount garbage disposal; then there’s the 9980 which is a unit with the exact specs, except for the mount. And it’s a wee bit more expensive because of the full metal mount. In the past few decades, PMM have slowly been taking over. They have been tested and proved to be much better than induction motors in almost every category. Many manufacturers now focus on building their products around the PMM, as Waste King has. PMM in Waste King garbage disposals pretty much spin at very high speeds, which is either 2600, 2700 or 2800 RPM (Revolutions Per Minute). It’s explained that optimizing and maxing out the chamber spin velocity can reduce the number of jams immensely. There’s nothing that, I think, is worth mentioning from inside the grind chamber. As opposed to Insinkerator, Waste King has not made any upgrades to their grind mechanism. It is as if they want to maintain the existing manufacture costs and that upgrades would jeopardize that. The grind components are also very standard – galvanized steel for the low power units (½ and ⅓ HP) and stainless steel for the stronger models (¾ and 1 HP). That is not to say that they underperform when it comes to ground result production. Numerous users have reported to be very happy and satisfied with how well these inexpensive models of Waste King work. Similar to the grind chamber/ components, there have not been much effort from Waste King to tackle this particular issue. Nonetheless, they do make adjustments in order to address complaints about noise. Although they don’t go as far as adopting additional anti-vibration and noise reduction technology, they opted and modified their PMM in the 1 HP units to serve the same purpose. It makes things quieter than the usual “loud”, albeit not very much compared to the Evolutions from Insinkerator. This is where Waste King strikes gold, the one thing that sets the company apart from many others food waste disposal brand. It’s pretty safe to say with confidence that Waste King CAN FIT every type of cabinet design out there. The forms and shapes of the models are available in good number, from the thin and long to the bulky and curvy, whatever you feel like. Their Whirlaway series even add more to their already large collection, with compact frame designs to push that space-saving attribute a bit further. At the moment, the Whirlaway 191 is selling quite well on its own, indicating that what it offers has met certain audience. Waste King is always proud to say that their warranty is the best. It’s true. Nowhere in the garbage disposer industry can you find another warranty offer that is longer than that of Waste King. Again, it depends on the models. At one end of the spectrum, it is the common 2 year limited warranty, but the other end can also reach as far as the 20 years. 20 years! No brand in the game is that confident of their product craftsmanship like the King we have right here. Both companies have their own strengths. Know your demands, know your spends. On one hand, if you want to enjoy the high-end, top-tier experience of owning a truly high-quality garbage disposal, the Insinkerator Evolution series is the one to tie the knot with, even though it’s a bit costly. On the other hand, if you are NOT willing to spend much on a kitchen appliance and the task being done is all that matters, then Waste King with their beastly power over cost ratio is the most logical choice.